Lemon yellow is a great choice for any home in San Diego. With its warm climate and plentiful sunshine, lemons and other citrus fruit are a part of the landscape. Because of this, it is never hard to get some inspiration for lemon zest in your home. Yellow can be a bold choice, so some people may be understandably overwhelmed at the prospect. However, yellow can be incorporated into any design theme with minimal fuss. Let the following ideas get you on your way to a fresh and fun interior design. 1. Festive fabrics. Fresh fabrics can always have a dramatic impact on any space, from a reupholstered chair to new window covers. By picking a fabric with yellow, the interior design will really start to pop. For a subtle addition, muted yellows mixed with grays or browns might be a good choice. Bright, sunny fabrics can anchor a new design with a distinctive flair. Fabrics can be selected in a range of styles, including geometric prints and soft florals. If yellow is still a bit daunting, consider a fabric where yellow is one of many colors. With yellow, it does not take much to make a statement. 2. Tasteful floors. While it is true that changing the floor is a somewhat long term commitment, the effect is spectacular. Lemony tones are increasingly popular in tile. There are also options for yellow carpet or wood floors with yellow undertones. Some stonework can also be chosen with hints of yellow. Even if yellow flooring is too much for the space, it is easy to pick a tile or stone that accents the color well to create a balanced look. For the best choices in tile and stonework, be sure to visit European Bath Kitchen Tile & Stone for a full range of dynamic choices. 3. Bright walls. To some, the idea of yellow walls may seem a bit extreme. However, it is worth remembering that yellow comes in a variety of shades. From a soft lemon to a bold yellow, paint colors are fantastic for redefining the room. 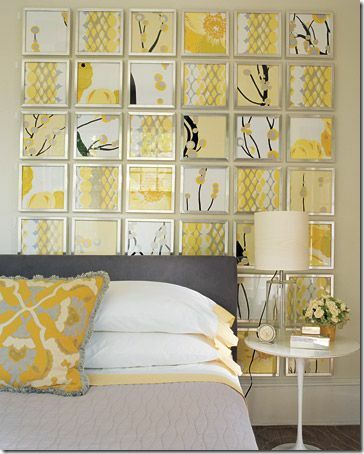 If four yellow walls seems daunting, consider a yellow accent wall. You could even paint the ceiling yellow for a sun-filled accent from above. Yellow can also be incorporated into the walls with other elements, such as painted baseboards, yellow crown moulding or artwork. 4. The real thing. The great thing about yellow is that it is a natural color, just like orange. So sometimes the best way to bring yellow into your space is to pick natural items that highlight the color. Yellow flowers, such as daffodils or roses, can make an elegant statement during the spring and summer. Even a bowl full of ripe lemons can be an excellent accent. These options are easy to use and add a fresh scent along with a distinctive decorating vibe. 5. Miscellany. Since yellow is often preferred as an accent color, there are countless options for accessories in this sunny shade. There are bigger items like yellow countertops or yellow pieces of furniture, but you can also throw in a yellow pillow or rug. In a bathroom, add some yellow towels or a rubber duck. In a kitchen, try a yellow light fixture or yellow pot holders. Look for yellow vases, dishes, candles, knickknacks and more. For inspiration, visit Cedros Avenue in Solana Beach. This boutique has countless choices for accessories and decor, making it a must for any decorating project. With these easy choices, adding a little zest to your home decor is easier than ever. Check out my Pinterest for more ideas!